Scottish scientists have been awarded a £250,000 grant to develop an infrared laser that can detect small planets orbiting stars in distant solar systems. The EELT is an international research project aimed at building a telescope that can interpret light data from the far reaches of the universe and is far more powerful than existing machines, such as the Hubble space telescope. Costing around £1 billion, it will be constructed on the top of a mountain in Chile and begin exploring space within the next decade. Currently telescopes can detect Jupiter-sized planets in other solar systems by detecting the “wobble” in light waves as they orbit their stars. However, the astronomical equipment is not sensitive enough to find some smaller Earth-like planets which may support life. The laser developed by the Heriot-Watt team, which uses the infrared spectrum, helps astronomers to detect even minor wobbles that indicate the presence of a smaller planet. The EELT will be able to observe objects that are 100 times fainter than those that can be found by most telescopes. The team’s participation in the EELT is rooted in the invention of a form of groundbreaking “comb laser” technology – so called because the frequency in which it operates resembles a pattern of closely spaced comb teeth. The funds from the UK Science and Technologies Funding Council are now aimed at proving the technology will work within the EELT. Reid said: “What we are bringing to the table is a new form of laser technology. It will interpret light from distant galaxies in more detail and identify the existence of planets and stars. 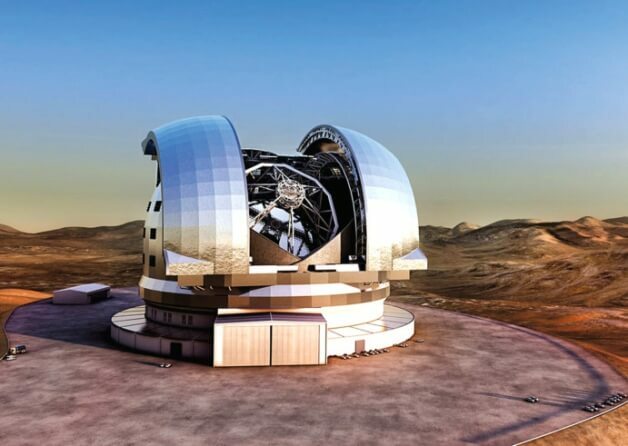 The 40-metre-wide EELT will be the largest optical telescope in the world and will gather 13 times more light than the largest of its rivals oday. Scientific goals include advancing astrophysical knowledge through detailed studies of planets around other stars and the first galaxies in the universe. Preparatory work on the construction of the EELT, which is supported and funded by 15 European countries including the UK, began at Cerro Armazones in Chile in 2012. Professor Colin Cunningham, the UK programme director of the project, is part of the team developing the powerful light-measuring spectrometer which will interpret signals from outer space with the help of the comb-laser ­device. Successful development of the Heriot-Watt laser would help boost the British presence in the project, said Cunningham, who is based at the UK Astronomy and Technology Centre in Edinburgh. He said: “It [the comb laser] will help us measure whether the planets are there or not. We can detect the gaseous giants but this will help us to detect some of the smaller planets the size of Earth or Mars. The EELT will be the biggest optical and infrared telescope in the world. Furthermore, he added, the EELT will allow astronomers to investigate the earliest stages of the formation of planetary systems and to detect water and organic molecules in the gaseous discs around stars in the making.